As far as weird PR gimmicks go, this is a pretty cool one. 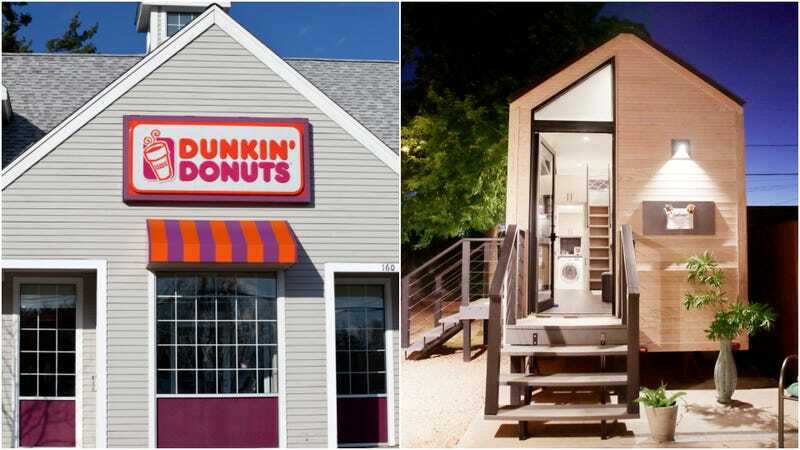 Dunkin’, née Donuts, collaborated with a sustainable biochemical company, a tiny home construction business, and Olivia Wilde to create a tiny home that’s fueled by spent coffee grounds. And Reader, I must admit that it is darned cute. Step 1: Extract excess oils in the spent coffee grounds. There can be natural oils left in spent coffee grounds, all depending on the coffee bean type and original processing methods. Step 2: Mix and react. These oils are then mixed with an alcohol to undergo a chemical reaction known as transesterification. This produces biodiesel and glycerin as a byproduct. Step 3: Refine. The biodiesel is washed and refined to create the final product. Inside, it’s got a “chef’s kitchen with high end appliances and a farmhouse sink,” a spa tub, a washer and dryer, a cedar porch, slate countertops, and a king-size bed. Olivia Wilde decorated it. Last fall, Dunkin’ offered the place up on Airbnb for $10 a night for a short period of time. Per House Beautiful, it was fully booked within five minutes. Like us, it looks like Architectural Digest missed this cool, weird story the first time around. I’m glad, because I love tiny houses. I would absolutely hate living in one, but they’re so nifty and little and cute, who doesn’t love those things? And I love bunk beds and lofts, and inset shelves, and tiny porches, and corporations doing weird but cool things to get publicity. Anyway, nice breakfast nook, Olivia Wilde. Very cozy.